Intel z370 motherboards were designed for the 6c/12t, so only the 9900k 8c/16t poses a larger power / cooling challenge, but that's nothing like doubling from 16c/32t to 32c/64t. Intel's slow pace of technology release plays into their favor for long generational CPU support, too bad they don't do that, until forced to by AMD progress. Glad to see you are looking at AMD alternatives to Intel. The Z370 motherboards (for the most part) will be fine with the 8 and 8/16 chips. Although I will admit if I upgrade to the 8/16 9900K which is very likely, I plan to grab a Maximus Z390 board to go with it as I sort of cheaped out on my Z370 Strix board. Not that I can't hit high clocks, I feel that in some way my board is still a limiting factor and 100% holds back my memory overclocks. I didn't buy expensive 4200Mhz DDR4 to not use it fully. I use my Tornado F5 as a prime example. It was designed for 4/8 CPUs at most, but handles the 6/12 8700K and 8086K perfectly fine. Motherboard manufactures did say back at Computex that some X399 boards would not handle the new Threadripper CPUs when overclocked. I reported this here back then, and seems it holds true. 7nm TR should fix this issue though and allow for forward compatibility. The 9xxx CPU's were originally announced as 10nm Ice Lake parts, with a recent Intel promise of Ice Lake 10nm in end of 2019, now pushed out to 2020...with a new "Coffee Lake R put in it's place for 2019. "Intel has been having issues with the 10nm process, that is no secret and the chips that are going to come out this year, as well as the first half of 2019, will be based on the 14nm process for sure. Intel assured that the 10nm Ice Lake chipswill be out in the second half of 2019 but a new leaked Intel roadmap shows that the Ice Lake chips have been removed and replaced with Intel Coffee Lake R CPUs instead. This means that the Intel 10nm process might be delayed to 2020. The process has been delayed time and time again and it would not be surprising if it was delayed yet again. Having that said, Intel is not only having issues with the 10nm process but with the production of 14nm chips as well. There is little that we know about the upcoming Intel Coffee Lake R CPUs but if the name is anything to go by then these upcoming chips will offer small improvements over the current Intel chips that we have on the market. 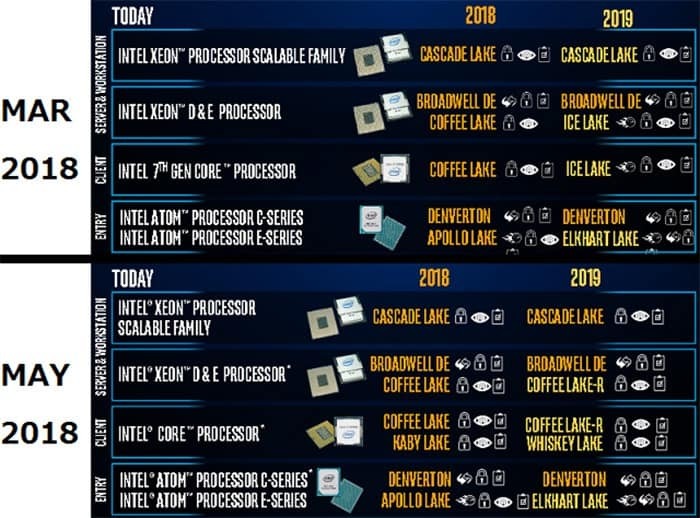 It is worth mentioning that these internal roadmaps often change and it is possible that the Ice Lake comes back on track in the near future but if Intel Coffee Lake R is going to come out next year then that certainly means that Ice Lake has been delayed and that other chips based on the 10nm process will come out in 2020 instead of 2019, as promised. Let us know what you think about all this and whether or not you think Intel Coffee Lake R will replace Ice Lake in the roadmap for 2019." Got a feeling this might have been posted a while back (not sure), but shortage of Intel CPUs likely at end of this year & into beginning of next - this is probably only gonna make 9700K/9900K even more expensive! Combined with NVidia price gouging on their new upcoming RTX lineup and not too mention the ridiculous RAM prices at the moment, this is a real bad time from a wallet perspective to be building a new PC! I feel that any new PC building is best left to end of 2019/2020 when NVidia is likely having launched their next gen after Turing (smaller process node & refined what they have learned about ray tracing), when hopefully Intel and RAM manufacturers hopefully have their shizzle sorted too! did you guys hear they will be using solder instead of TIM? Yep.. Go back in the thread a little - http://forum.notebookreview.com/thr...e-lake-cpus-z390.811225/page-11#post-10770364. Fast forward a bit - http://forum.notebookreview.com/thr...e-lake-cpus-z390.811225/page-12#post-10771997 and you can pick it up from there. "In a statement to OC3D, Canadian laptop developer Eurocom confirmed that the Intel 9900K and 9700K CPUs will be soldered to their IHS. When Intel launched their Ivy Bridge desktop CPUs, they switched from solder to a less thermally conductive TIM, and continued the tradition all the way to Coffee Lake. In August, Videocardz leaked some slides suggesting that Intel's next mainstream CPUs would be soldered, but that rumor wasn't confirmed by a PC manufacturer until now. "New Intel i9-9900K and i7-9700K CPUs are coming with gold soldered TIM/IHS to the CPU die. This should help manage the temperatures of the higher-clocked CPUs and will also help with achieving higher overclocked frequencies. Our Sky "C" super-laptops are ready for 9900K/9700K." jclausius and Papusan like this. Gold layer is also only very thin and only to have the actual solder make contact with the LID. Vasudev, ajc9988, jaybee83 and 2 others like this. The soldered IHS 9900k / 9700k info was posted here in July. Yeah, I wondered about that detail myself, but doesn't that image from that facebook page you posted have a back drop of "goldish" material in tint? Wait, so is that supposed to be a "pasted" IHS 9900k? finally used thermal grease . " Vasudev and Aroc like this. Vasudev, bennyg and ajc9988 like this. That can't be right, can it? How devastating... if true.